While there are a number of downloadable office suites available online such as those offered by Apple and Microsoft, installing extra software on your machine takes up time and system resources. Fortunately, there are a number of cloud-based office suites which you can start using right away. Aside from saving you the trouble of installation, any documents you create are stored online so you know they’ll be safe if something happens to your machine. You can also access the same files across multiple devices. In this guide, you’ll discover five of the very best cloud-based office suites online today. Zoho Corporation is a software development company which provides in web-based business tools and information technology solutions including an office and IT management software suite. It was founded in 1996. Zoho Docs is an online suite of programs including a word processor, presentation program and spreadsheet software. 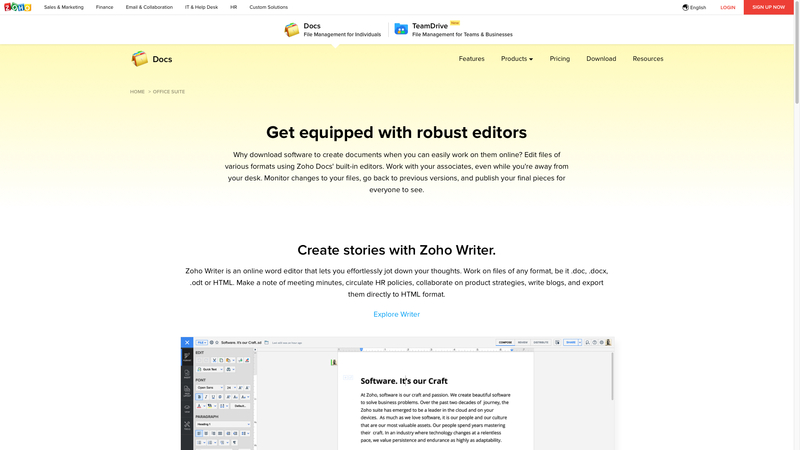 Zoho Writer is an online word editor. Users can work on files in any format such as .doc, .docx, .odt or HTML. Users can publish documents directly to WordPress. Writer also offers a handy digital signature feature. Zoho Sheet includes built-in formulas for fast and accurate calculations. Users can also create charts and pivots to organize their data. Zoho sheets also allows users to share and collaborate with others. Show is Zoho’s version of PowerPoint. Users can insert images, videos and real-time Twitter feeds into slides. Presentations can also be shared through social media. Zoho offers a 15-day free trial. The ‘Free’ tier is suitable for teams of up to 25 users. It includes 5GB sync per user, 1GB file upload, admin controls, Dropbox integration and secure file collaboration. The ‘Standard’ tier is $5 (£3.84) per month per user. It includes 100GB per user, 5GB file upload limit and unlimited file versions. The ‘Premium’ tier is $8 (£6.14) per user per month. It includes 1TB per user, 25GB file upload limit and unlimited file recovery. Some online reviewers have noted that this could be expensive medium sized businesses. For instance, a company with 500 employees would need to pay $4,000 (£3,068.21) per month for the ‘Premium’ tier. OnlyOffice is an open source office suite developed by Ascensio Systems SIA who are based in Riga, Latvia. It is available in over 22 languages and boasts Oracle as one of their leading clients. The free tier, known as the &apos;Community Edition&apos; is most suited for small business and allows up to 20 connections at once. This suite does not just offer the usual features such as word processing or spreadsheets but is very useful for order fulfilment and for documenting sales. The handy calendar feature allows users to keep up to date with personal and work-related tasks as well as keeping an eye on deadlines. Third party integration is also supported. You can create your own Mailboxes with the &apos;Mail&apos; tool. As with other office suites you can create and edit documents, spreadsheets and presentations. Users can collaborate on projects and make comments in files where necessary. Users have reported that support can be hard to find and that the online chat forum community that is used to provide help can be tricky to navigate. 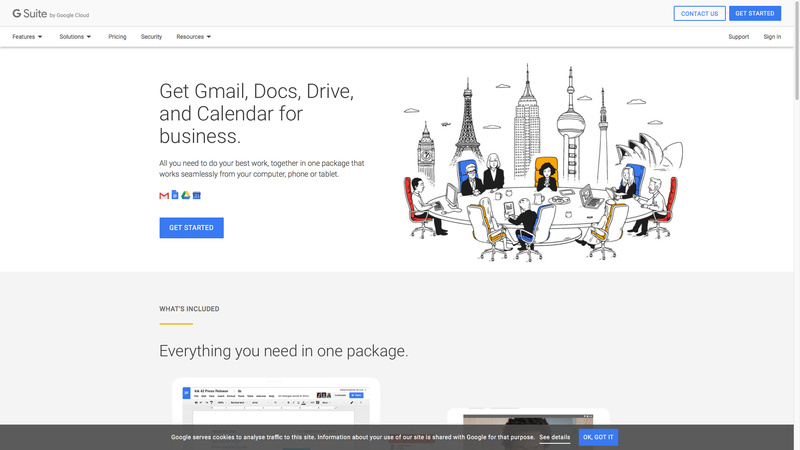 G Suite is a brand of cloud computing, productivity and collaboration tools developed by Google. It was first launched in 2006. The software is made up of Docs, Sheets and Slides as part of Google’s cloud office suite. It also includes Gmail, calendar and hangouts. Users can upload their own documents, spreadsheets and presentations for customizing their own office templates. Users can create documents in your browser with Google Docs. It allows multiple users to work at the same time. Users can view other users edits as they type. You can also communicate through built-in chat and insert comments. Users can export in most formats such as .docx, .pdf, .odt, .rtf, .html and .txt. All changes are saved. Previous versions of your documents are kept indefinitely at no extra cost. Google Sheets enables users to view their spreadsheets through charts and pivot tables. Users can work on Sheets even when they are offline. Sheets is compatible with other formats such as Microsoft Excel. Users can work and collaborate on presentations with multiple users using Slides. Admins get to control who can edit, view or add comments. There are multiple presentations to choose form or users can create their own presentations from scratch. The ‘Basic’ package is $5 (£3.84) per user per month and includes 30GB of storage. The ‘Business’ package is $10 (£7.67) per month per user and comes with unlimited storage and archiving. The ‘Enterprise’ plan is $25 (£19.18) per month per user and offers advanced controls and capabilities. Online users have complained that the functionality of Sheets and Docs is not as broad as online versions of Word and Excel. 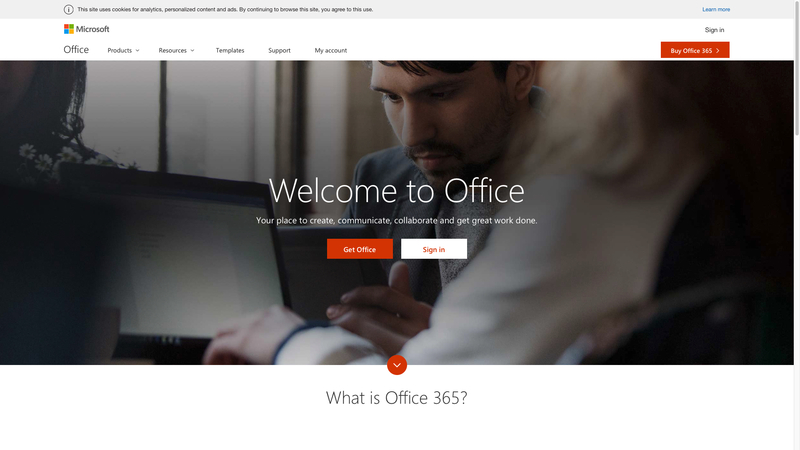 Microsoft Office 365 is a line of subscription services offered by Microsoft. It was launched in 2011. It is comprised of Word, Excel, PowerPoint, OneNote and OneDrive amongst others. Subscribers receive 1TB of storage through OneDrive. Users can share files with others. You can control who edits each file and how long they have access to it. OneDrive includes multi-party video sharing, content sharing, shared calendars and team chat. Subscribers also have access to Word, Excel and Powerpoint. Users do not need to download these applications. They are readily accessible online through a subscription. Microsoft Office for Home is priced at $9.99 (£7.67) per month and includes up to five computers. ‘Office 365 Business’ is $10 (£7.67) per month per user. The ‘Premium’ tier is $15 (£11.51) per month and includes Exchange, SharePoint, Skype for Business and Microsoft Teams. 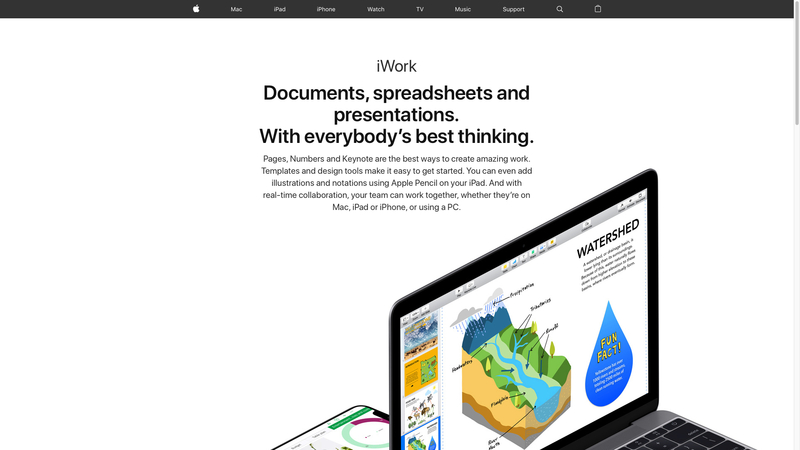 iWork is Apple&apos;s own office suite. It consists of Pages, Keynote and Numbers. The suite is eclusive to macOS but there are versions on the cloud that can be enjoyed by users of other platforms. There are three separate apps, each for word processing, preparing presentations and for creating spreadsheets. Numbers, Apple&apos;s spreadsheet software, shows a blank canvas on launch, rather than a daunting grid view. It’s very easy to add images, tables and charts as you go. The word processor, Pages, is very simple and is perfect for straight forward documents. It is not inundated with layers of options that exist within MS Word. Pages also allows users to collaborate on their work and has now added a feature that supports EPUB which can be created and shared to iBooks. The presentation app, Keynote, has been referred to as the better alternative to PowerPoint by online users as it is straight forward and easy to use. It creates beautiful presentations without the hassle that can be associated with PowerPoint. MS Office may not be able to open iWork created documents but all iWork applications can export formats that are compatible with other suites.